With all my recent vacations, I feel like a negligent blogger. But never fear! I’m back in full force, packed with ideas, pictures, and posting possibilities! 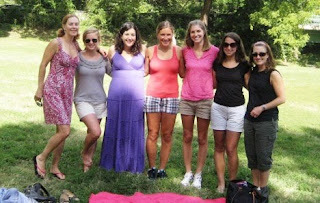 On Saturday, the lovely Liz from Liz Runs DC organized a blogger meet-up picnic in Rock Creek Park. (This is the same girl who did the Workout Party back in May.) We spent a lovely afternoon lounging on blankets, eating delicious salads, and chatting about running and yoga and biking and blogging. Check out her post here. I say “salads” but let’s be real here…I brought cupcakes. I guess I can kinda sorta squeeze myself into the “Healthy Living” blogger category, but not really. I mean, I blog about running and that’s a healthy lifestyle choice...but I also blog about breakfast cookies and eating butterscotch straight out of the Tupperware, which may or may not be construed as “unhealthy.” And reading? Well it’s healthy for your mind, right? Anywho, the picnic was great, and I rounded out a wild Saturday night with some yoga and an AMAZING new book (get excited – post to come!). In light of her accomplishment, I felt obligated not to whimp out of my own long run on Sunday. (Not in a competitive way, just in an other-people-do-it-and-it’s-no-big-deal-so-I-should-just-woman-up-and-run sort of way.) So I did 11ish early Sunday morning. The first 5 were rough but 6x6 joined me for the last 6, and that made it much better! The rest of the day was spent being tired from running and enjoying the gray and cool day (sooo nice after the blistering summer we’ve had). I met up with some friends for a Baked and Wired experience (the best cupcakes/coffee combo in DC!). The Chai Cupcake = awesomeness. And the Texas Chocolate Cookie = divine! Then we walked up to Adam’s Morgan Day. The city closed down two streets of AdMo for food and clothes and jewelry vendors, and live music and dancing. It was an Eastern Market-ish experience, but much closer to my house! I’m pretty pleased with my weekend. As I said, I made cupcakes for the blogger meet-up. They’re kind of healthy! 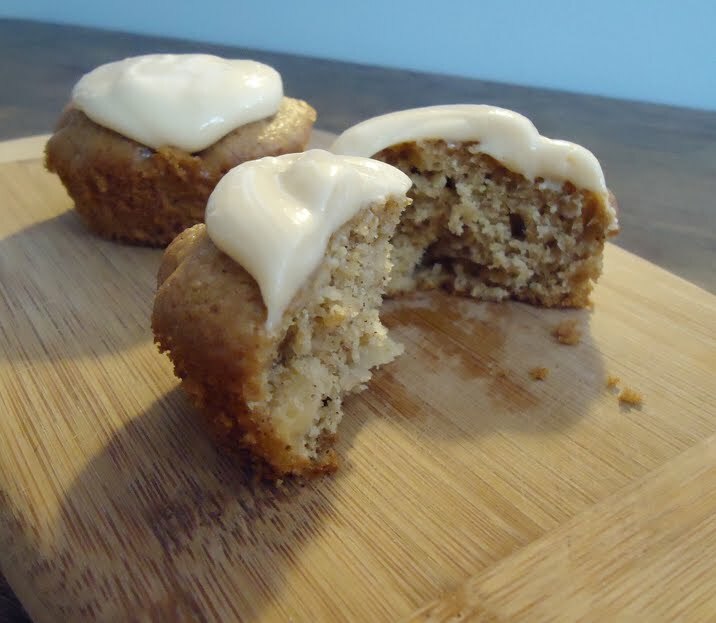 I mean, there’s apples and whole wheat flour…so I think they’re more like an airy muffin with frosting than a cupcake. Either way, they’re delicious!!! In a stand mixer, beat together the brown sugar, oil, cinnamon, and extracts on medium speed. Add the eggs one at a time, beating for one minute after each addition. Add the dry mixture to the wet mixture, then beat until well-blended. Stir in the apples. Fill the cupcake liners ~1/2 full with batter. Bake for 20 minutes or until a toothpick comes out clean. Cool cupcakes in the pan. 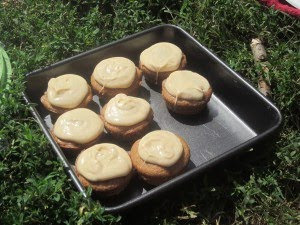 While the cupcakes are cooling, mix together all the frosting ingredients, then frost the cupcakes as desired. For added caramel flavor, pour some caramel syrup over the frosted cupcake. Enjoy!